Welcome to the tool that you can use to create your own READ® posters, bookmarks, and more. This page will help you get started using the READ Design Studio to build relationships with your community and patrons, personalize your library's promotions, introduce staff, highlight collections, and make fun giveaways that you can use to promote your school, library, and all the resources you offer! 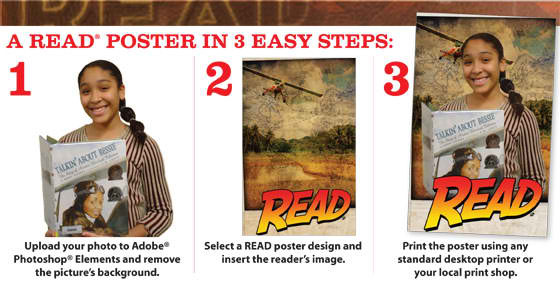 Here are some links to helpful information about using READ Design Studio Products and the process of making your own posters. If you have further questions, please contact us at graphicsmarketing@ala.org or at 1-800-545-2433, ext. 5411.